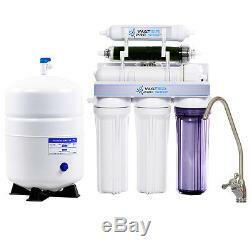 Water Pro US - 6 Stage Dual Use Reverse Osmosis Water System w/ 100 Gallons Per Day (GPD) Membrane Capacity. Pre-Assembled System for quick and easy installation! This system is designed for both drinking water as well as Aquarium Reef water application. One outlet is used for supreme quality drinking water & the other outlet is for ultra-pure aquarium water application (0 ppm). 100 % Built in USA. Pressure Tested System Ensuring the Highest Standards of Quality. Stage 1,2,3 (Change Yearly) 3 REVERSE OSMOSIS DRINKING WATER FILTER: SEDIMENT/CARBON/GAC. Stage 1,2,3,5 & 6 (Change when green DI starts turning brown) DUAL REVERSE OSMOSIS DRINKING WATER FILTER SEDIMENT/CARBON/UDF and 9 oz of DI. Stage 4 RO Membrane (Change after 2-3 years) 100 Gallons Per Day: Reverse Osmosis Membrane Drinking / Aquarium Water Systems. 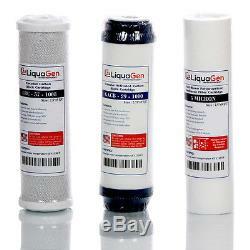 This system is Water Quality Tested Ensuring the Highest Standard of Quality. 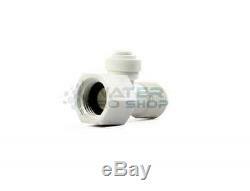 For Aquarium (DI) the outlet is with tubing and a straight ball valve. 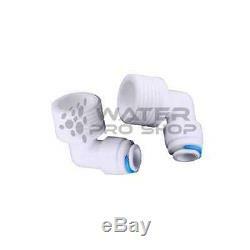 For Drinking Water the outlet is via a Carbon Filter which is for taste and odor reduction. The Carbon Filter is connected to a straight Valve. The System goes through the Following Filtration Stages. Stage 1 : Sediment Block (5 Micron). Stage 2 : Carbon Block Filter. Stage 3 : UDF Carbon Filter. Stage 4 : 100 Gallons Per Day Membrane (GPD). Stage 5 : Aquarium Use - Deionization (DI) Filter (The filter is clear and when the DI starts turning brown is an indicator it needs to be replaced). Stage 6 : Inline Post Carbon Filter for Drinking Water Application. This Systems Includes the following parts. 3.2 Gallons Storage Tank w/ Capacity of 2.8 Gallons. Color Coded FDA Approved Tubing. Extra Set of Connectors w/ blue clips. Operating Temperatures : A Maximum 113° F B Minimum 39° F 3. Operating Pressure : A Maximum 115 PSI (5.95 kg/cm2) B Minimum 40 PSI (2.95 kg/cm2). Do not allow RO System to freeze. 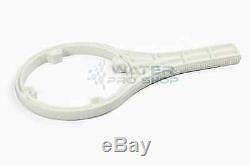 The membrane always contains water and will be destroyed if frozen. Do not plumb RO System to hot water. This will destroy the integrity of system components. If pressure B 40 BelowA pressure regulator is advised to maintain proper pressure. Personal checks may be held until cleared. Drinking Water System when installed and operated within recommended parameters, with the exceptions stated below. How Long Does The Coverage Last? Drinking Water System that is damaged because of neglect, misuse, alterations accident, misapplication, physical damage, or damage caused by fire, acts of God, freezing or hot waters or similar causes. The item "6 Stage Dual Home Drinking + RO/DI Reverse Osmosis Water System 150 GPD USA" is in sale since Tuesday, November 27, 2012. 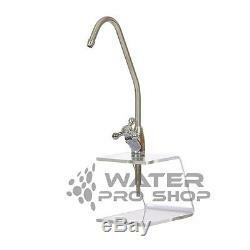 This item is in the category "Home & Garden\Kitchen, Dining & Bar\Small Kitchen Appliances\Water Filters".usa" and is located in Cypress, California. This item can be shipped to United States, Canada, United Kingdom, Denmark, Romania, Slovakia, Bulgaria, Czech republic, Finland, Hungary, Latvia, Lithuania, Malta, Estonia, Australia, Greece, Portugal, Cyprus, Slovenia, Japan, China, Sweden, South Korea, Indonesia, Taiwan, South africa, Thailand, Belgium, France, Hong Kong, Ireland, Netherlands, Poland, Spain, Italy, Germany, Austria, Russian federation, Israel, Mexico, New Zealand, Philippines, Singapore, Switzerland, Norway, Saudi arabia, Ukraine, United arab emirates, Qatar, Kuwait, Bahrain, Croatia, Malaysia, Brazil, Chile, Colombia, Costa rica, Dominican republic, Panama, Trinidad and tobago, Guatemala, El salvador, Honduras, Jamaica.